Broadmeadows is a residential and industrial suburb 16 km north of central Melbourne and until 1994 it was a municipality. The lightly wooded landscape between the Merri and Moonee Ponds Creeks attracted pastoralists in the 1840s. In 1850 a Government survey laid out a township in an area along the Moonee Ponds Creek valley, now known as Westmeadows, but then named Broadmeadows. An Anglican church was built in 1850, and the church, police station and Broadmeadows Hotel (now Westmeadows Tavern), in Ardlie Street were the first village centre. The old Council chamber and office are nearby. East of the old village is today's Broadmeadows, for which the early town centre was Campbellfield. In 1857 the Broadmeadows District Road Board was formed. Its area had Essendon on the south and it extended as far north as Mickleham, placing the village very much in the southern third of the Road District. Two weeks and one day after the outbreak of World War I the Australian Army established the Broadmeadows Military Camp in the open area between Broadmeadows and Campbellfield. Reticulated water was connected in five days, a project which the shire had been unable to persuade the Board of Works to undertake in seven years of negotiation. The camp and the surrounding areas were the venue of numerous bivouacs and military exercises. In 1951 the Victorian Housing Commission announced its proposal to take over 2270 hectares of land in Broadmeadows for a housing estate. The Commission's housing construction proceeded apace, but the provision of shops and other facilities lagged. Glenroy became the main local shopping area, four kilometres to the south. Schools were opened in time for the new population: Broadmeadows East and Broadmeadows South (later Glenroy North), in 1956, and Broadmeadows and Eastmeadows in 1961, the latter also attended by children from a migrant hostel in the military camp. The Commission built in the area between Broadmeadows and Glenroy in 1958, and the Jacana and Campmeadows primary schools were opened the following year. During the 1960s three secondary schools were opened – two technical and one high. Catholic schools comprise a primary, a coeducational secondary and a boys' secondary. 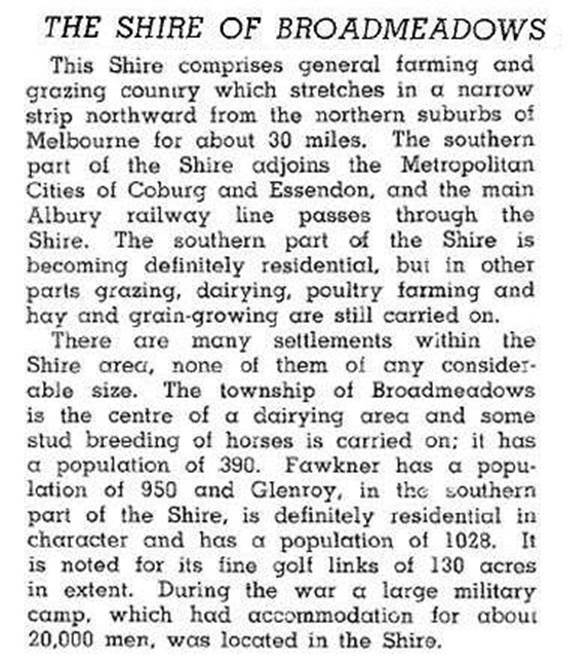 Some way through Broadmeadows' urbanisation it was decided to sever the rural parts north of Somerton Road and attach them to the adjoining Bulla and Whittlesea Shires. This occurred on 31 May 1955, and next year on 30 May Broadmeadows was proclaimed a city. Six months later the Housing Commission began the transfer of a wedge of its land at Upfield and Campbellfield for the Ford motor car factory, which reactivated the railway which had been closed (again) the previous year. The Ford factory opened in 1959 and four other substantial factories opened the following year along the Hume Highway. In May 2013 Ford Australia announced that it would close its Broadmeadows factory in October 2016, involving a loss of about 700 jobs. The Commission built 7996 houses and 189 flats. Schools were overcrowded, swimming pools unbuilt until 1962 and speech nights were held at Coburg or Essendon. A new civic hall and council offices were built in 1964. The adjoining local shopping centre, Meadow Fair, existed only on Housing Commission paper until the 1970s, and finally in 1974 it was completed. It is now the Broadmeadows Shopping Square, considerably enlarged to over 20,000 square metres of gross lettable area. The site for a hospital, however, remained empty until Broadmeadows Health Service opened in 1998. During the 1970s and 1980s Broadmeadows had a reputation for boisterous youth: the Broady Boys rode the trains and daubed graffiti proclaiming that they ‘rule, OK’. By the 1990s this had lessened and there was a catch-up of some of the facilities long denied. Jacana gained a golf course, much of Westmeadows is a reserve, Broadmeadows Valley Park, on a Moonee Ponds Creek tributary. The town park is opposite the shopping centre and there are two reserves beside the reduced military barracks. The technical school site is occupied by an Islamic College and there are State and Catholic secondary colleges. Space is reserved for further enlargement of the shopping centre, but public libraries were in other town areas under the Council's jurisdiction until the Hume Global Learning Village opened in 2003. Whilst Broadmeadows went without facilities such as a library, local churches and clubs were social centres and basic education requirements were met by technical and high schools. There were plenty of apprenticeships and jobs after school, and generational poverty through unemployment was uncommon. When the Commission's building program began Broadmeadows was outer suburbia. In the 2000s a distance of 15 km from central Melbourne does not seem so far, particularly on a railway line. Celebrities such as Eddie McGuire, television presenter, and John Ilhan (Turkish, 1965-2007), the founder of Crazy John's mobile phone chain grew up in Broadmeadows and have been keen advocates for the district. The suburb of Broadmeadows is a relatively small one, surrounded by the Commission's other suburbs. Its population is less than Fawkner's. On 15 December 1994 Broadmeadows city was united with most of Bulla Shire and parts of Keilor and Whittlesea cities to form Hume city. At the 2011 census religious affiliations of residents included Islamic (30.4% of respondents, compared with 2.9% for Victoria) and 67.6% of families had both parents born overseas.